American Custom Golf Cars or ACG started in 1988 as a small company called IFG, who back then supplied innovative body modification kits to the automotive specialty market. Ray Hoogengrad purchased IFG and then spent the next five years establishing it as the world’s leading component car manufacturing business. Not long after, the company was designing and manufacturing specialty components and even producing movie cars. Some of the company’s most memorable work includes the cars used in Batman 1 and 2, Sean Connery’s The Rock, and Dolph Lundgren’s Army of One. ACG as it is today was established in 2000, when it also started a partnership negotiation with famous automobile hot rod designer, Boyd Coddington. This collaboration saw the market release of a hot-rod styled golf cart – the California Roadster. ACG has also produced on stage electric show cars for rock artists, and custom one-off show cars such as the world’s only Harley Davidson motorcycle limousine, and a Red Bull jet engine funny car. Find all ACG Campground vehicles. All six ACG campground golf car models can be LSV/NEV certified with a top speed of 25 miles per hour, and can be licensed for street use in the United States – so all models can be used and driven on city streets with a posted speed limit of 35 miles per hour or less. ACG, which is known as American Custom Golf Cars was originated way back in the year 1988. A small company called IFG pioneered the distributing of innovative body modification kits which have become available to the automotive market. Later on, a businessman named Ray Hoogenraad had interest in buying the company IFG. Five years later after buying the company, it stands out and become one of the world’s leading manufacturer of ACG campground golf cars. The company is very popular in the car manufacturing industry. In fact, it was used to several international movies and stage electric show cars. You can spot ACG on both part one and two of Batman, The Rock, and Army of One. It also produced custom one-off show cars like the one of a kind Harley Davidson motorcycle limousine and the Red Bull jet engine powered the funny car. It was in the year 2000 when it became ACG. The same year, it was partnered with Boyd Coddington, a famous automobile hot rod designer. The collaboration of the company with Coddington results in the introduction of a hot-rod styled golf cart in the market. It was named after the California Roadster. ACG has 81 licensed distributors around the globe to reach its international consumers. Golf Cars Unlimited is one of its reliable distributor that aims to deliver only the best Campground golf cars to suit your needs. Browse all our ACG golf cars today! For any inquiries or concerns, feel free to drop a note on our site and we would be more than happy to assist you. 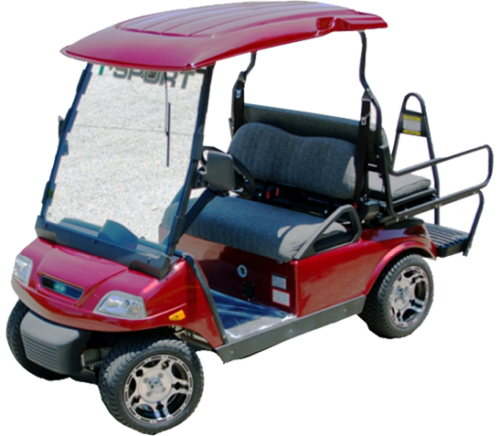 T-Sport GT: ACG’s T-Sport GT is a classic and modern campground golf cart that comes with a powerful 48-volt, 3-phase induction motor and six 8-volt batteries. The T-Sport GT seats four passengers and comes with a flip back rear cargo seat. T-Sport LX: ACG’s T-Sport LX is a compact custom utility vehicle with a trendy design and modern features. 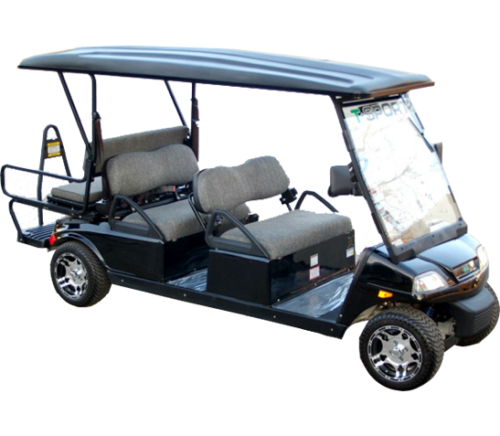 It comes with an AC motor with a peak output of 17.5HP and 48V battery system, making it a reliable transportation choice for golf courses, gated communities and campgrounds. It also features an on-board power source and LED signaling system. T-Sport 2: ACG’s T-Sport 2 is an ultra modern campground golf car that can seat two passengers. It has a powerful direct drive, 48-volts, 3-phase induction, 17.5HP peak engine under its hood, with a six 8-volt series batteries and rack and pinion steering system. T-Sport Cargo: The T-Sport Cargo is a two-seater campground golf car with a built in cargo box – making it perfect for your transportation and hauling needs. It has a powerful AC 17.5HP drive motor, six 8-volt batteries, automotive style master on/off key, and a SEVCON 3” LCD display screen. T-Sport: ACG’s T-Sport is a small yet sturdy campground golf cart that can seat four passengers comfortably. It has a powerful 17.5 peak HP AC motor that allows it to reach 25 miles per hour and a SEVCON computerized controller – which allows easy driving and maneuverability. T-Sport Limo: The T-Sport Limo is perfect for big groups with its six passenger seating capacity, and corrosion-proof aluminum structure. In spite of its size, the T-Sport Limo can still cruise to a top speed of 25 miles per hour, thanks to its 17.5 HP AC motor and 48 Volt system. This model also features a SEVCON computerized controller, hydraulic braking system, and plush interiors. When buying a product, the price is always one of the things to consider. ACG Campground golf cars are elegant but affordable. You will get the best out of your pocket. No need to spend too much on your golf cars since ACG provides affordability. The engineering of ACG Campground golf carts ensures excellent and finest quality.Bringing only the best production of ACG to sustain the market’s quality demand. The company uses only top of the line materials to ensure the quality the market is expecting. Since it has 81 licensed distributors, ACG is widely available. Golf Cars Unlimited caters clients in New Jersey and nearby cities. You can easily contact them thru the website, email, phone, and in their office address. Aside from using the product as a golf cart, it can be used as a multi-purpose vehicle. It can be used in your neighborhood and on the streets. In fact, some customized ACG vehicles are used in movies and car shows. Driving is one of the most exciting things to do in the world. However, if you are uncomfortable with the vehicle you are driving with, it will be an awful feeling and may lead to dissatisfaction. ACG ensures in providing you a luxurious driving experience by giving comfort and pleasure in one. Some of the great things you will experience are full leather interior, hard top, flip-down monitors and multimedia systems to make your experiences to the fullest. Golf Cars Unlimited provides a wide array of services and easy to reach thru email or a phone call. The services include repair &; maintenance, upgrades, delivery, and storage solutions. During winter, it is ideal to keep your vehicle in storage to protect it from tearing down due to the weather. Each year, ACG sold around 2,500 vehicles per year including ACG Campground golf carts. The company is so popular worldwide and stands as an industry leader in its field. It is continuing in growing and innovating new and state-of-the-art electric vehicle technology.